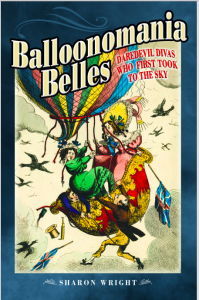 Balloonomania Belles reveals the astonishing stories of the fabulous female pioneers of balloon flight. More than a century before the first aeroplane women were heading for the heavens in crazy, inspired contraptions that could bring death or glory and all too often, both. Author Sharon Wright reveals their hair-raising adventures in a book that brings the stories of the feisty female ballooning heroines together for the first time. Women were in the vanguard of the ‘Balloonomania’ craze that took hold in the eighteenth and nineteenth centuries and swept across Europe then the world. Their exploits were a vital element of our first voyages into the sky. When women’s options were often severely limited by law and convention they managed to join the exhilarating quest for spectacle, adventure and danger among the clouds. Many of the brightest stars of this extraordinary era of human flight were women. From the perilous ascent in 1784 by feisty French teenager Elisabeth Thible, female aeronauts have never looked back… or down. Who were these brave women who took to the air when it was such an incredibly dangerous and scandalous thing to do? Sharon Wright brings together in one book the show-stopping stories of the very first flying women.